It’s coming up for two weeks now since our initial nutrition visit at Pets at Home and we are almost entirely on the new food now. From now on I should be able to see if the new food makes any difference to how my dogs behave or look. Why does it take so long, you might ask… well… changing dog food is a slow process. Dogs don’t take well to changes in food, so it can’t be done overnight. The balance of the bugs in their digestive tract need time to develop so that they can digest the new foods. 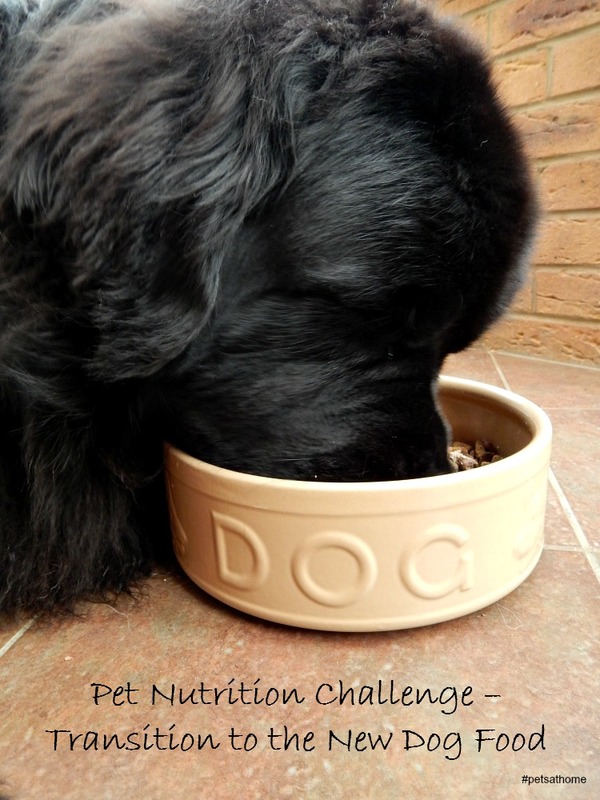 When changing your dog food it is very important to examine the maximum feeding guidelines very carefully. You have to know exactly how much your dog should be fed. And if you are feeding a mixed meal, such as adding fruit or veggies on a regular basic, this also has to be taken into account. Ideally you should put on paper everything your dog eats, count the total intake and reduce some of the main food to make space for all the additional bits and pieces. Let’s take our Bunk as an example. + He gets about 10 treats a day (doggie milky bones, quite small in size but he really likes them). He weights 62kg and according to Arden Grange Senior feeding guide he supposed to get 670g of dry kibbles a day. This would be perfect if he didn’t eat anything else. Now, because he gets all these additional foods, his daily allowance of kibbles had to be reduced. Taking into consideration all the additional things he eats his daily amount of dry kibbles eaten has dropped to 420g. Quite a big difference, isn’t it? I think this is the main reason why there are so many overweight dogs. Normally we just look at the back of the food bag, make our calculations and then just stick to them. Most of us have never even considered reducing the amount to make “space” for all the extras we feed our pets. To be honest I didn’t know that a carrot or some apples would have to be taken into consideration too, but they have to… they contain sugars and are not calorie free (I wish they were). Do you feed just one brand of food or like to mix it up? Stella’s main part of her meals is a brand called Gentle. It is a cold-pressed food rather than a kibble and is much better for her sensitive tummy. She loves apples especially, but since being on medication she is a scavenger that will eat anything she can get her paws on. I have to be really careful about what’s left lying around now! I remember now… we had a Twitter chat about this once… I will have to look into it in more details… as it ended up I need a new food for Bunk. We hope to be getting a dog soon…I’ll have all this to look forward to. My dog is on the hills science diet, he has hip dysplasia and we give him the joint support food in the hope it helps! This is a very interesting post. We don’t have a dog, but our cats need slow transitions to new food too or they’ll get horrible tummy problems. Don’t be sad. I am sure she is looking after you from the bridge. Our spaniel eats anything he can get hold of really. We tend to stick to the same type of dry kibble but he hoovers up most scraps and anything disgusting he can find when out on walks! We don’t own a dog, though maybe some day. It will be a steep learning curve if ever I do. I never knew it was so complicated. My son has declared this morning that he wants a dog. Hope it all goes well. Good Luck if you are getting one! My dog eats a mixture of kibble, raw meat and natural instinct raw minced dog food. He acts hungry all the time but we weigh out all his food so know he is getting the correct amount! I watched a show about it once, often people just fill the bowl with kibble, not realising how calorific it is, or don’t take into account treats etc! We would love to feed raw, but they do not want to eat it. We did almost two week trail taking it really slow and no luck. Apples yes but make sure they do not eat seeds. In bigger amounts they can be toxic for dogs. This is really interesting. We mainly feed Alvin a dry food recommended by the VET. He also gets some meat and veg, but he is not overweight. It will be interesting to see if it makes a difference! Great tips too.